10Investigates: Where does all that Florida SunPass toll money go? FDOT collects more than a billion dollars a year in toll money...which it is spending on more toll roads. TALLAHASSEE, Florida - More than a billion dollars a year flows to the state of Florida from drivers crossing the Sunshine State's 700-plus miles of toll roads and bridges, the most in the nation. 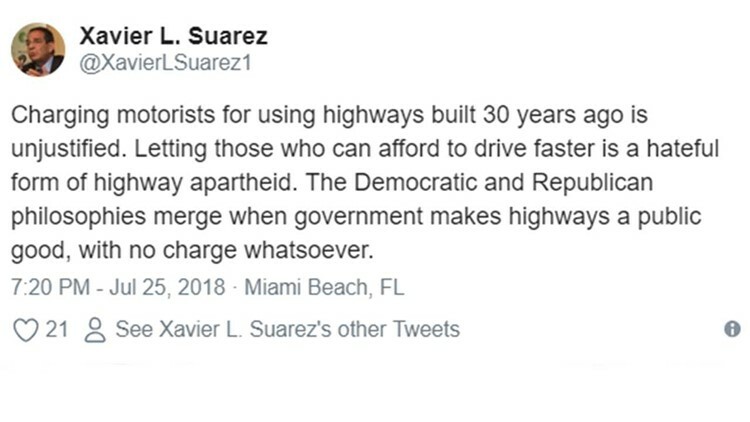 But much of that infrastructure is already paid off, prompting 10News viewers, irked by the state's massive summer SunPass disruptions, to ask why FDOT is still charging drivers to travel those roads. The answer is simple: Florida is using the toll proceeds to build even more toll roads. But there's nothing simple about convincing some drivers toll expansion is a good idea. In Hillsborough County alone, separate controversies have exploded in recent years over proposals to put express toll lanes along I-275 and I-4, express toll lanes over the new span of the Howard Frankland Bridge, as well as plans to expand the Selmon Expressway to the Gandy Bridge. Florida has added more than 100 miles of new toll roads since Governor Scott took office eight years ago, with even more planned. FDOT and its Florida Turnpike Enterprise (FTE) division have grown their annual toll revenue from $600 million in 2011, Gov. Scott's first year in office, to $1 billion in FY 2017. And when the state's existing roads are paid off, they'll continue to collect revenue as profit-makers for the state. Toll roads: the new gas tax? Better fuel economy and inflation have reduced the spending power of gas tax collections, unchanged at the federal level since 1993. And even though Florida has increased its gas taxes with inflation, many transportation experts say its time to re-think how governments fund roads. Among them: Bob Poole, the Director for Transportation Policy at the Reason Foundation, a libertarian think tank. Poole helped innovate toll lanes in the 1980s and helped shape Scott's attitude on toll roads when he was elected in 2010. "We need more highway capacity in urban areas because people are not going to get out of their cars," Poole told 10Investigates. "The gas tax is gradually running out of steam…because you go twice as far on a gallon of gas today than you did 25 years ago." Poole was also an advisor to Governor Scott's 2011 transition team and consulted Scott on his 2011 rejection of federal high-speed rail funds, even before the Florida Department of Transportation could finish its analysis of the project. He says transit can be improved when buses take advantage of express toll lanes, and park-and-ride lots are built with toll revenues. But Poole says transit is not the answer to congestion. Poole had a hand in the toll-expanding attitudes of the Bush and Crist administrations, but Florida may not have ever seen a governor as toll-friendly as Rick Scott. Scott has utilized toll roads as a way to spread highway costs to the drivers who use them most, as well as tourists who may not be Florida residents. He's also supported more pay-as-you-go bonding, urging state agencies to avoid taking on new debt without the revenues to support new projects. Critics say tolling highways is nothing more than a regressive tax, but Poole contends the gas tax is just as regressive. He says technology has advanced to a point where the gas tax should be abolished and drivers should only be taxed on the miles they drive, monitored electronically. However, he admits its a plan more technologically-feasible than politically-plausible. Tampa's Rick Fernandez is one of the critics who says Florida shouldn't be proud of being the country's most-tolled state. "It is frustrating that we are putting so many eggs into one basket," Fernandez said of FDOT's brisk road-building pace. He says the state should be more focused on reducing congestion by taking cars off the road through transit improvements and more pedestrian- and cyclist-friendly investments. "Our problem here is we have no way to get people from Point A to Point B without using a car and a road," Fernandez continued. Critics have also argued Tallahassee is not always equitable about spending drivers' toll revenues in the same communities they collect them. The Florida Turnpike Enterprise's list of planned road expansions includes projects in all corners of the state; some larger than others. One process that became necessary as the state continued to expand and streamline its toll-collection was an upgrade of SunPass, the state's electronic tolling systems. That process went horribly wrong, and now, four months later, it is still trying to get customers back up-to-speed. ►Click here for a running report card of other SunPass problems 10Investigates has tracked.